This Just In! 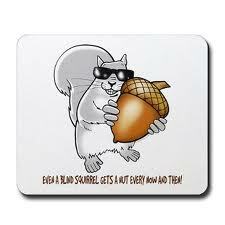 Blind Squirrel Finds Nut! To fully understand this passage, one must read the entirety of chapter one. The literary structure can be summarized simply using our key term “dominion.” God created kingdoms: outer space, the sky, the sea, and the land; then God created three kings to exercise “dominion” in each “kingdom”: celestial bodies, birds, sea life of every kind, and the race of Man. There is a progressive significance in this creation week, with the creation of Man as the climax. With God’s creation of Man, he gives him a vocation: fill the earth, subdue it, and take dominion over the lesser forms of life. Man lives on the earth as a kind of vice-regent of God. This passage is applied in many ways by many people, but it can be reduced to something more or less like this. God created Man, then he gave him something to do. How this idea has been applied varies according to the theological tradition to which the believer subscribes. Throughout the middle ages, Roman Catholic traditions drove a wedge between the sacred and the secular in such a way that those who were inclined to a vocation of church ministry were seen as inherently superior to everyone else in the ordinary, profane occupations that seemed anything but spiritual. There were priests who worked for God (good), everyone else worked for the world (not so good). In the sixteenth century, the Protestant Reformers recovered the biblical truth which they called “the priesthood of the believer.” This doctrine emphasized the fact that Christ was the High Priest who mediates between God and Man, and all believers, ordained minister or not, are priests who may now approach God and offer spiritual sacrifices on the basis of Christ’s mediation and intercession. But the Reformers didn’t leave this truth at this point. Application of the priesthood of the believer was made to every aspect of his life. In short, what are his responsibilities? That is his ministry. This idea brought a renewed dignity to labor and developed what is known as the Protestant work ethic. This work ethic taught each believer-priest to work for the glory of God and the good of his neighbor in whatever way his interests, skills and opportunities allow. Much of the productive, technological and industrial development in the modern world finds part of its roots in this Protestant work ethic, which influenced Western culture for the better. As the centuries wore on, this truth became less and less clear, and Christians became less aware of the spiritual significance of their secular vocations, and the work ethic largely fell by the way side. While historic orthodox Protestants retained this doctrine at least in their theological volumes, if not always preached and lived in their lives, but others kept it in mind, working for the glory of God in their own personal way as the Reformation doctrine of vocation went largely neglected. In the great cultural shift that took place in the 1960’s, some Protestant ministers, notable among them, Francis Schaeffer, sought ways to recover this truth by encouraging Christians to “engage the culture,” in order to be used by God to once again be the “Light of the World” and “The Salt of the Earth,” in other words, Christians whom God may use to bring glory to God by enlightening their neighbors to the Light of the truth which is in Christ, as well as by being a benefit to their neighbors in their work and their service. In the decade of the seventies, a few ministers in the charismatic movement had a similar desire to encourage their congregants and the church at large to live more consistently and more visibly as Christians in a sinful world. They, too, had a sense that evangelical Christians had largely ceased being influential members of society, and wanted to do something about it in their way, according to the understanding of their theological tradition. To put it inelegantly, I consider these efforts by Schaeffer and these charismatics, among others as blind squirrels who found a nut, as the old saying goes. The “nut” being some concept of the historic doctrine of vocation. Fast forward to 2011. This desire to glorify God and serve and evangelize their neighbors becomes misinterpreted by the Left Wing of the American political system as efforts to “take dominion” over the federal government of the United States and establish a theocratic form of government. Looked at in this light, now, doesn’t it sound silly? Now let’s engage in a comparative study. First read Lutheran journalist and blogger, Edward Gene Veith’s blog post “Vocation as the Christian Life,” and learn more about Luther’s doctrine of vocation and how it ought to be applied in this generation. Then watch the following video posted at www.the7mountains.com and see if you can detect similar motives. Then stop listening to reactionary political Leftists who think those crazy extremist Right Wing Christians are out to overthrow the government and start stoning adulterers and burning witches. That was perhaps the most scary video I’ve seen in a long time. I’m glad you enjoyed it. But I see in my site stats that you didn’t also link to the post on Luther’s view of the doctrine of vocation. Don’t just settle for the sensationalistic part of the discussion. This is supposed to be ultimately a lesson in the doctrine of vocation. The Seven Mountains is more about vocation than theocracy, only in their little misguided charismatic way. Take it to the bank.